Rockstar Energy Racing made the journey across the Canadian border for the only International round of the Supercross series and another frozen tundra. With sub zero temperatures, measured in celsius, and howling winds, it was literally bone chillingly cold at times in Toronto. While the atmosphere was much more pleasant inside the stadium, the track itself did not treat riders with a very warm welcome. It was technical and rutted and contained a huge triple that created a lot of close calls on the first lap of every race. The soft soil caused the whoop section to cup out severely, making it very difficult to negotiate. It claimed several riders, including Ivan Tedesco. Ivan was riding the best he has all season by far. Not only did he have his best qualifying time in practice 1 with a tenth, he also backed that up with the same result in P2. Ivan then rode great in his heat, just missing out on the top 4 and going straight into the main. One thing that was notably different was Tedesco's starts. They had improved vastly since the last time he lined up. He secured the holeshot in his semi and went on to easily qualify and avoid the LCQ. As he exited the track, he excitedly told his mechanic, Brent "China" Myron that he would now be entering the 100th main of his career! He had been keeping that a secret while being forced to sit out the past two rounds at 99. The stage was set for an amazing story. However the story turned bad early in the main event. As IT was drag racing through the whoops and battling for position, he hit one of the kickers and went completely over the bars and hit very hard. He was very beat up from the crash and was unable to finish. Ivan Tedesco: "The day was goin good. Felt decent in practice, and in the heat and semi. Then in the main, I got a pretty good start and I was trying to make some moves, then I don't know what happened in that whoop section. I ended up going feet over my head and flat backed it and kinda hit my head. Hurting pretty bad right now. Going to checked out this week and see where we go from here." The team has been waiting for a breakout ride from Cole Thompson since the East Coast 250 series began. He has been close multiple times but has had to deal with some bad luck and mistakes, keeping him out of where he knows he should be finishing. Now for a good story. What better place for Thompson to turn around his season than at home in Canada where he hails from. With huge support from the local fans, and an emergence of aggressive riding, Cole went on to finish in the top 5. This marked his career best finish and certainly spiked his confidence. The next stop of the 2014 Supercross Series will be held in St. Louis, MO. Tedesco will checked out by doctors this week and see how bad his injuries are. 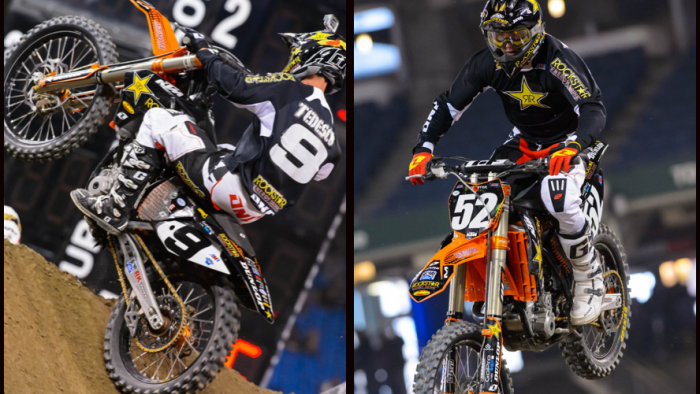 Thompson will aim to carry over the momentum from Toronto and try to get the team's first East Coast podium finish.